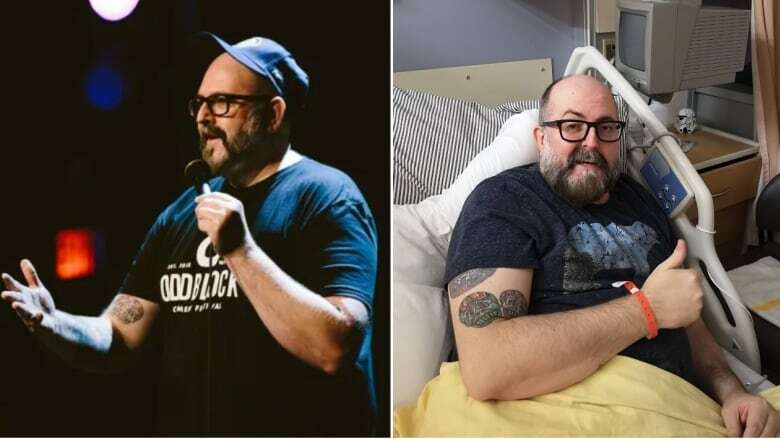 A Winnipeg standup comedian no longer able to stand on his own says he is mining a prolonged hospital stay for laughs later on. John B. Duff stood under spotlights, cracking audiences up at comedy clubs and festivals for 15 years. As the co-founder of Winnipeg's now defunct Oddblock Comedy Festival, he helped showcase upcoming talent. Now, in his hospital room, Duff, 51, is unable to walk or stand without assistance and his left hand doesn't always move how he wants it to. Multiple brain lesions landed him in hospital in January where he's been ever since. Doctors still don't know what exactly caused the damage. "There's a sense of hopelessness when you're going through this," Duff said by phone Monday night. "I'd much rather be working. In the game. I'd much rather be going to movies with my girlfriend." The mystery illness came on relatively quickly, Duff said. In October he was "strong as an ox." By December, a stubbed toe would send him hurling forward onto the floor. "I just started falling down a lot. My balance was completely off. I had no strength in my legs," he said. Through it all he's noting experiences — like messy bathroom trips or how when he falls his body sounds like "a bag of wet garbage," that could be a whole lot funnier when he feels better. "All the half premises are present. The food is terrible. The beds are uncomfortable," he said. "You find humour as a coping device." Another coping device — support from friends. An online GoFundMe fundraiser organized by Duff's long-time friend and fellow comic, Chad Knutson, has already brought in thousands of dollars to help with his rent and bills while he's unable to work. "That's like a huge weight lifted," Duff said. "It's massive. It's incredible." Meanwhile, each day he spends an hour at the Health Sciences Centre's rehabilitation gym, working on regaining his balance and strength. He imagines being up on stage with a microphone again one day — it's just a different picture than it once was. "I'll always do standup," he said. "I just maybe leaning on a walker when I do it."